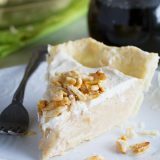 A creamy maple filling is topped with whipped cream and sugared almonds in this Maple Cream Pie Recipe that can easily be made without any refined sugar. It is sweet and silky and simply delicious. In a large saucepan, whisk together the cornstarch and the salt. Slowly whisk in 1/2 cup of the milk. Whisk in the rest of the milk and 3/4 cup of maple syrup. Cook over medium heat until thickened, then reduce the heat and continue to cook for 2 minutes, stirring constantly. Turn off the heat, then slowly whisk in some of the hot mixture into the egg yolks, whisking constantly. Stir the egg mixture back into the saucepan and return the pan to the heat, cooking and stirring constantly for 2 more minutes. Turn off the heat and whisk in the cubes of butter, one at a time, until fully incorporated and melted. Stir in the maple extract. Let the mixture come to room temperature. Whip the whipping cream until it starts to thicken, then slowly add in the powdered sugar (if using). Continue to whip until soft peaks form. When the pudding mixture is just at room temperature, fold in 3/4 cup of the whipped cream. Pour the pudding into the baked pie crust. Stir the remaining 1 tablespoon of maple syrup into the remaining cream and spread over the top of the pudding. Refrigerate the pie for a few hours or overnight. To make the almonds, combine the almonds and the sugar in a skillet over medium heat. Cook, stirring constantly, until the sugar is melted and coats the almonds. Pour out onto a sheet of waxed paper into a single layer. Allow the almonds to cool completely, then break up the almonds. Just before serving, top the pie with the sugared almonds.